Soldier, civil servant, community activist. Born at London, England in 1886, he emigrated to Western Canada when he was young. He served in the First World War with the Princess Patricia’s Canadian Light Infantry, and was discharged in 1916, with the rank of Company Sargeant Major. 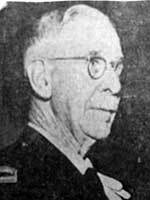 In 1935, he moved from Saskatchewan to St. James, Manitoba, where he served as the first member of the Manitoba Division of the Canadian Corps of Commissionaires and also served as the Sargeant-at-Arms for the Manitoba Legislature until 1957, being succeeded in the latter post by George Milne. Very active in the community and the St. James Anglican Church, he taught a Young Men’s Bible Class, directed the Young People’s Drama Group, served as Rector’s and People’s Warden and for many years was the lay reader of the Parish. He died at Winnipeg on 20 September 1971. Obituary, Winnipeg Free Press, Wednesday, 22 September 1971, page 45.